Back on August 17, my friend Chris Greazel and I attended the Graduation show at Art Center College of Design in Pasadena. This fuzzy photo is of (I think I remember this right) Jeffrey Jarvis, a student at Art Center and this table is interactive. The table responds to touch and Jeff had programmed it to respond in interesting ways. I bent his ear a little and got him to talk about the technology a bit. It can respond to multiple touches but it’s not a multitouch screen, it responds to the various inputs/touches serially. His application was built in Flash/ActionScript and it did various semirandom actions when you would put a finger down. The resolution of the display is 768×768 pixels, relatively low resolution compared to Microsoft Surface I should think. Jeff was telling me that before they put the leather outer casing (making it nice to lean on) the interactions people would do were much less comfortable. Making it easy to get engaged. I mentioned that I had heard Jim Bumgardner speak about interfaces at Yahoo a few weeks ago at the Web Developer Meetup and he said that is was Jim Bumgardner who taught this class! 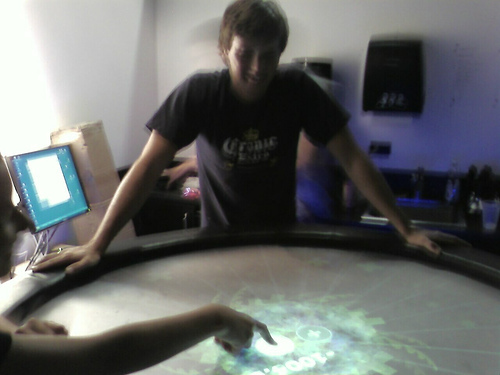 All in all, a great evening out for my old friend and I.
Philip van Allen is teaching students to work with Interactive Multi-Touch table this summer using an Oracle, a round, multi-touch table designed originally for use in the harsh environment of the Detroit Auto Show (e.g. it does not use a camera for touch detection). The table, on loan to the MDP from George P. Johnson (GPJ) in exchange for a first-look at new concepts developed by our students, was originally designed by MDP alum Nikolai Cornell, Interactive Design & Technology Lead at GPJ, who brought in Philip van Allen and the Moto Development Group to design the technology. Joe Crawford blogged this at 9:16am in 2007 in August. The 28th was a Tuesday. You are reading this 12 years later. Comment. There are 2 comments Tweet. Send email. It has hashtags→ photos . The table project was actually taught by Phil Van Allen. I taught a class that Jeff Jarvis attended on advanced Flash / Actionscript, and helped out some of the students who were working on making scripts for the table. The student’s name is JONATHAN Jarvis rather than Jeffery. In regard to the table, it is fully multi-touch — not sure what was meant by responding serially — so as many touches and people who want to touch can at the same time. The roundness of the table is especially conducive to this kind of collaborative interaction. But in many ways, the harder questions are what is it good for, and how can we make really rich interactions?